Animals first ventured into the shallow waters of coastal areas during the latest Ediacaran Period. By the Cambrian Period, certain animals were beginning to make excursions out of the water. Afterwards, during the Ordovician, Silurian, Devonian and Carboniferous periods, arthropods, molluscs, vertebrates and various groups of worms invaded floodplains, rivers, deserts and lakes – resulting in widespread colonization of land habitats towards the end of the Palaeozoic Era. Just like the origin of life itself and the evolution of complex multicellular animals, the invasion of land was one of the major transitions in Earth history - leading to the expansion of life and laying the foundations for the modern biosphere. How did the invasion of land proceed and what routes were taken? What did animals do and how did they diversify when encountering a new environment for the first time? If the colonization of each new environment can be viewed as an evolutionary “experiment” – what were the results each time the experiment was run and what does this suggest about any underlying macroevolutionary processes? How have animals interacted with and engineered their environments through time and are there any long-term positive feedbacks between the evolution of animals and their interactions with their environments? To try to answer these questions, we used trace fossils. Most people will be familiar with body fossils such as dusty old dinosaur skeletons but, from my own somewhat biased perspective, trace fossils are far more dynamic – representing the structures left behind in the rocks by the activities of once living animals. They include things like trackways, trails, burrows, bite marks and faeces that may be preserved from millions of years ago. Essentially they are fossilized animal behaviour. They can tell us what animals were doing, where they were doing it, when they were doing it, and with whom else. Ordovician-aged trace-fossil trackways from the Borrowdale Volcanic Group, Lake District, UK. Specimen held at the British Geological Survey, Keyworth. Trackways are under a centimeter across. The project began towards the end of 2010 when I moved to Canada thanks to a Government of Canada Post-doctoral Fellowship from the Commonwealth Scholarship Commission. 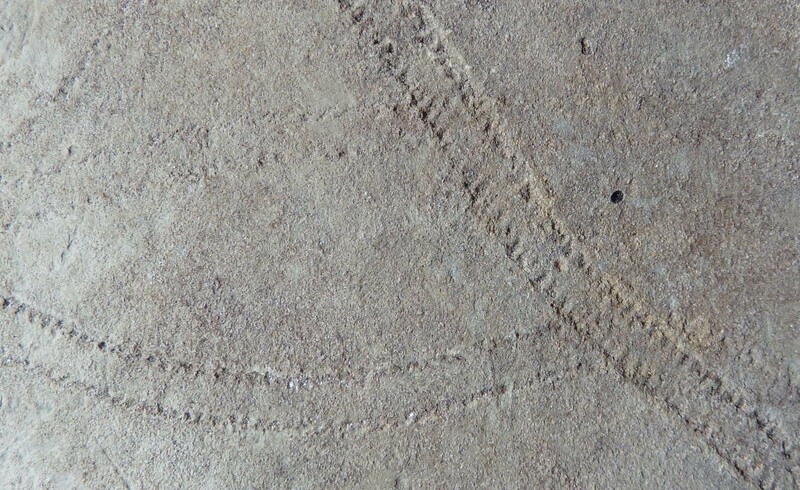 Up until that point, my own experience of trace fossils was from the Permian and Carboniferous periods and so a team was gradually assembled to include expertise from older parts of the geological column and also in terms of continental palaeoenvironments, the role of land plants in the evolution of terrestrial habitats, and arthropod palaeobiology and palaeoecology. Tremendous openly accessible resources with in-built analytical tools exist for compilations of body fossil occurrences. Unfortunately, no such databases exist for trace fossils and so it was necessary to assemble this from scratch for the project. This involved large amounts of time - following the paper trail to track down as many published reports of continental trace fossils as possible. Once located, the taxonomy in each had to be checked and revised if necessary in the light of more recent taxonomic work. Ages and palaeoenvironmental interpretations for where the trace fossils came from had to be also validated. At some point, after moving back to the UK to take up a lectureship and acquiring a full academic teaching load, a line had to be also drawn as to when we would stop adding data from newly published sources. In total, our database ended up comprising precisely 383 trace-fossil assemblages from 266 trace-fossil bearing geological units and spanned the latest Ediacaran Period up to the end of the Permian Period. After all of that, and rightly so, the question had to be posed as to whether this database was in fact any good. The fossil record is notoriously patchy and so tests need to be conducted, or corrections applied, to ensure that any patterns identified are in fact real as opposed to just an artefact of biases in the fossil record. Whole papers in themselves and research careers are devoted to answering these types of questions – but in our case this was a necessary step of analysis that would ultimately largely be consigned to supplementary information. Database assembled and checks and balances completed, it was then time to analyze our data and try to find out the answers to our original questions. How does one go about analyzing patterns in this type of data? In order to achieve this, it was necessary to come up with new analytical frameworks. Trace fossils are given taxonomic names but these are not equivalent to biological taxa. We rarely know what biological species produced a trace fossil – unless it is preserved in its death throes at the end. However, this is not really a hindrance because the trace fossil tells us whereabouts in the sediment the animal was living, how mobile it was, and how it fed. These three pieces of information combine together to give us a mode of life as represented by the trace fossil. This is rather reductionist, but weighted against that is the power to compare data from different time slices of geological history and different geographic locations. In addition, we were able to develop frameworks that categorized the overall effects that animals were having on their sedimentary environment, as well as the broad groupings of behaviours that were being performed. Analytical frameworks for categorizing modes of life and impacts upon sedimentary environments. What was surprising about our results was that diversification of modes of life, impacts upon the sediment, and behavioural programmes all followed the same pattern – an early burst of rapid diversification and a long period of relative stasis – each time animals conquered new habitats, first with the margins between sea and land, then floodplains, followed by rivers, deserts and lakes. Each diversification that animals underwent during the colonization of a new environment was an evolutionary experiment, yet the results were very similar. We know experiments tend to have different outcomes if you change the parameters, but in this case, there is a consistency which suggests a fundamental constraint on the behavioural and ecological roles fulfilled by animals on land. In addition to having a database that we can now ask other questions of, the analytical frameworks open-up other opportunities for future avenues of research. Another major transition in the evolution of life on Earth was the evolution of social insects, such as ants and termites, which worked together to build complex structures and societies. More recently too, was the emergence of intelligent life – animals which could make and use tools, including humans and our ancestors. We are yet to investigate how animals diversified and modified their environments during these events and how this shaped our planet. In addition, the frameworks allow us to compare ancient and living communities. This may help us understand if modern communities are undergoing fundamental changes and reaching tipping points, as ancient ones have in the past, for example, in response to climate change. The paper, published in Nature Ecology and Evolution, can be found here.